Chandler Riggs as his fans calls him Chan is no doubt an uprising star. He has stolen the heart of millions of people but do you know who has stolen his heart? If you have are a regular follower of Chandler, then you might know about the mysterious girl. Even if you haven't we are here for you. here we have gathered all the information regarding Chandler Riggs's personal life regarding his girlfriend and past dating history. To know more, stay with us. Chandler Riggs is dating Brianna Maphis now. Brianna who is his fan even before she met him. You might know Chandler Riggs by his play on AMC's The Walking Dead in which he plays Carl Grimes, son of a former sheriff, Rick Grimes. One of the original cast members of the series, Riggs has accomplished as a child actor. Charles got Saturn awards four times for best performance by a young actor in The Walking Dead. For your information, he started acting since he was 10 years old that was back in 2010. Guess how old he is now? Now Chandler is a 17-year-old now and has grown more handsome and his hair too suits him the most. Don't you agree? Time sure slips by fast and he seems to be fully aware of that as he enjoys sharing quality time with his bae. Chandler does not mind sharing pictures of him and his girlfriend on his Instagram. 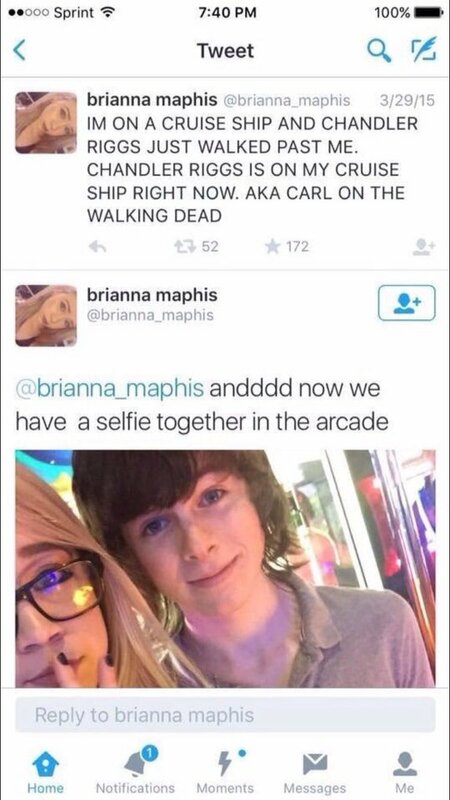 Chandler Riggs is now dating Brianna Maphis but there is not much information about Brianna. But we have got some clues about their relationship. Do you know how they met? According to her twitter posts, they met on a cruise while Hana was on vacation with her family. Then she asked for a picture and one thing led to another. Although they did not start dating immediately after their first meeting the journey of their love has definitely begun on the cruise. Even though there is not much information about when but they sure began dating somewhere, sometime. It has now been a year and the duo is still holding strong. The young man even reached on his 18-year-old girlfriend's graduation ceremony, which could mean Chandler does take the relationship seriously. We honestly hope he does. Not only in graduation ceremony but the couple, as fans called them Brandler also showcased their relationship by wearing a matching t-shirt. A lot of teenage couples do that these days which is more of a fashion trend for couples in a relationship. Moreover, the young actor also followed his girlfriend to her prom. It appears that they cannot stand apart from each other. Chandler was wearing as guys always wear to prom, a pair of black tux. His partner was not less stunning, as she wore a black gown adorned with sparkling stones. Well, the cute lovebirds are adorable. On the other hand, Maphi also does not miss to show love for her actor boyfriend. She shared a picture on Instagram on the occasion of her boyfriend’s 17th birthday. Aww, how sweet of her! And no doubt Chandler celebrated his 17th birthday with his sweetheart, Brianna. They were even spotted kissing in the Life of Color event. But Brianna is not the first girl that nicked his heart. He had once been in love with a girl named Hana Hayes back in 2014, before Brianna. Like Brianna, Hana had also posted adorable pictures of them on Instagram as well as Twitter. But something did not work out as the couple broke on 17th of March a year after they started dating. News of their break up millions of their fans. A fan even wrote a story based on their characters on Wattpad. Why not? Chandler and Hana had become relationship goals at the time for teenagers like them. There was even a speculation that the reason for their break up was Chandler's co-star Katelyn Nacon. Nacon, by the way, plays the character of Enid, with whom he is in love with in The Walking Dead series. Chandler Riggs and I made a mutual decision to not be romantically together. It's a personal loving choice.....our friendhip is strong....we are both sad. Honestly, we do not know why they broke up. Nevertheless, it is a good thing they have decided to remain as friends. They might have found out that they were incompatible and had different choices. Whatever might have been the reason, Chandler already got past his break up. He had good moments with Hana but past is past. 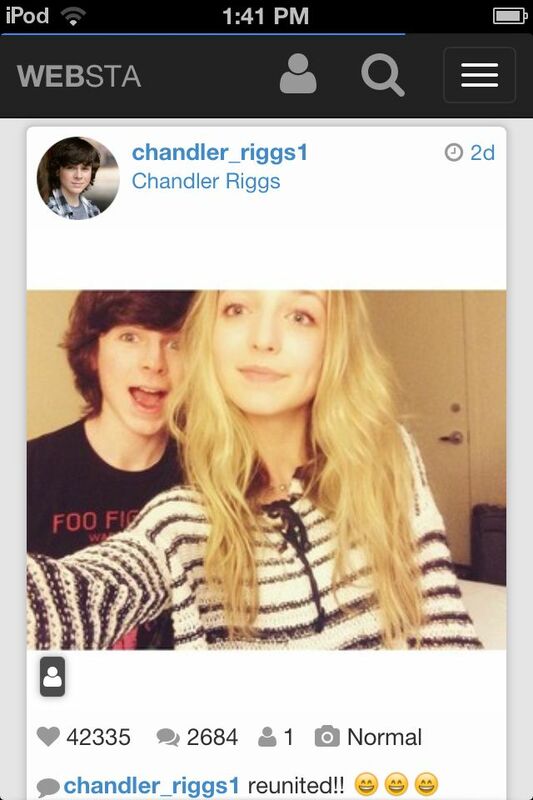 Chandler Riggs is more than happy with Brianna Maphis as his girlfriend at the moment. That's it for now. Stay tuned for more updates.